The best intranets are all different: they look different, they run on different technology stacks, and they have different content, people and processes. However, there are some common ingredients that are common in each. 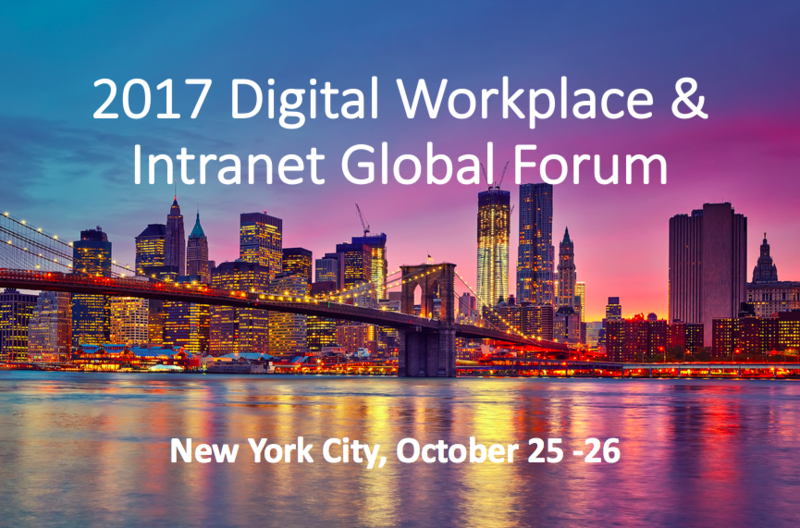 In November, we hosted a very well-attended webinar (more than 100 corporations participated) on “The best intranets,” highlighting the best intranets showcased at the 2016 Digital Workplace and the Intranet Global Forum conference in NYC. Many of the very best intranets were showcased, from Coca-Cola to ConocoPhillips, Cisco to Comcast, Pfizer to Pitney Bowes, and many others. However, the 60-minute webinar could not fully showcase two days of superb intranet case studies. There were many, many questions from the audience regarding these excellent intranet case studies — too many to answer in the time provided. So, here are some of the questions, with answers, to a few of the most important issues facing intranet managers and owners. Q: From the From your experience, which department in the organization owns the intranet? Often it’s a cross-functional team with primary budget responsibility by IT (for the technical infrastructure) and communications (for the design, editorial and content). There is often a separate “product management” group that attends to the overall solution (long-term decisions about feature/functionality, technology platform, product roadmap, etc.). This is also cross-functional, reporting to the Intranet’s Strategic Steering Committee. Often, corporate communications owns the home page, and the user experience; IT owns the technology stack; and HR owns all of the human resource components and applications. Q: What 2 to 3 key trends are you hearing about organizations moving intranets from on-premise to the cloud? Flexibility: Modern organizations are enabling employees to access corporate data from a multitude of locations and variety of devices. This flexibility can be made easier by employing cloud services which are often more fluid and dynamic with the ability to add new services and spin up new businesses and efficiently respond to increasing customer needs. The flexibility offered by cloud services enable enterprises to adapt and offer effective services to customers. Cost: Most companies treat the cost of cloud computing as an operating expense, rather than a capital expense. This has accounting advantages, as well as not requiring the company to make a substantial up-front investment in hardware/software, since Cloud services are paid for often on a monthly or quarterly basis (with a mutli-year contract). Deployment speed: The amount of time required to procure, setup and install on premise hardware and software takes far longer than using a cloud service. Q: Did all of the Coca-Cola sites ultimately live on the same platform? How does search work? The Coca-Cola Companies are moving to a single intranet platform over time. As sites are upgraded (onto the new platform), they are integrated into search. The most effective means to manage stakeholder resistance is to engage these stakeholders and make them a part of the project or decision making process, as early as possible. Set up a structure that involves them early and often (e.g. interviews, focus groups, surveys). And make sure the intranet is directly addressing their business needs. This alignment to their needs is critical, and should be thoroughly addressed in the intranet strategic plan. Q: Can you suggest resources around Intranet Governance either now or at a another webinar? Prescient has extensive experience advising companies on setting up intranet governance models and processes. We have an excellent white paper that outlines a good deal of ideas. See the SharePoint Governance White Paper, which provides governance lessons and recommendations for all intranets, not just SharePoint. Q: Are you seeing more intranets with user-generated content or is it still more centralized news getting broadcast? It depends on how you define content. And the size of the organization. For traditional employee/internal communication, there is a move back to a central content posting process (not necessary content origination/ownership) for the sole purpose of efficiency. It is generally efficient, especially in smaller organizations, to have a small number of highly trained people handle content posting, page creation, etc. than to try and train people who may undertake the posting activity on an infrequent basis. That said, for employee collaboration and any social content, such is being generated and posted directly by employees. Many leading intranets have both, and both types of content are on the rise. Q: Can you please tell us how many FTEs work on each intranet? You mentioned 7.5 work for H&R Block. It’s difficult to get accurate industry data that we have confidence can be used for comparison. Most companies can tell you how many people worked on the redesign. But once the new intranet is launched, many people throughout the organization are after involved – in limited roles – in maintaining content. And that’s where the numbers become unreliable. More often than not, a company of 10,000 employees has about 2-4 FTEs dedicated to the intranet. But some have more, some less. It all depends on how much the executive suite values the intranet. Q: With social becoming more popular, how are companies integrating internal social platforms such as Yammer? Many companies have tried social tools, such as Yammer, Chatter, Jive, Slack and now Microsoft Teams. These tools work very well in small working groups. Most of our clients have found that rolling out these tools requires a clear strategy and purpose, coupled with a plan to promote it, and deliberate use-cases of how it will be used. “Built it and they will come” does not work outside of small work groups. Often these tools are not integrated into the home page, but live in its own spot on the greater intranet. 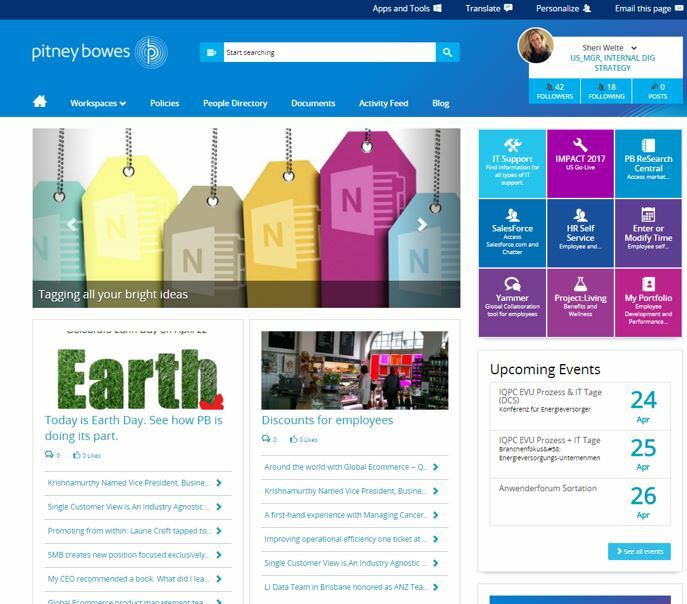 Two years ago, for example, the Pitney Bowes intranet had a Yammer webpart embedded in the home page. But soon it was considered a waste of important real estate, and now Yammer is separate from the home page. Q: What were the platforms used from the examples you spoke about today? Microsoft SharePoint, Adobe Experience Manager, Alfresco, IBM. Q: Is IBM using in-house AI technology to help personalize the intranet? If not do we have an idea of how much it cost them? Yes, IBM is using their own technology, including Websphere and Connections, and their own artificial intelligence (AI) software to help deliver personalized information. IBM often deploys commercial software they are developing with their employees as means to test and explore. Most of what IBM is using is available for purchase from them. We do not have internal development cost information. Q: How big of a trend is it to have companies moving away from email communication to strictly intranet-based communications like Cisco has? A change from the push mentality to the pull mentality seems to require a huge amount of change management. Absolutely – a huge amount of change management. There is no question that everyone has email overload. Companies are using many strategies to reduce email proliferation – including communications on intranets, targeted alerts, and messaging apps. Some are highly integrated into the intranet, such as Jive, Chatter and Teams. Others are more stand-alone applications, such as Slack. Regardless of tool, you are correct that change management is key – and most companies vastly underestimate the effort, or the time it takes for people to become comfortable with a new way of sharing. Old habits die very hard, and email is here to stay, but broadcast email is being reduced in favor of the intranet. Q: Can we say intranets are becoming more consumers of other systems to build out the site than in the past? For example, various blocks on the home page could consist of blocks of data from other external systems serviced by APIs/web services? Maybe similar to the CEC intranet. Yes, intranets are increasingly presenting data from more and disparate data sources. But they are also, with it comes to content, becoming more robust platforms themselves. Take Microsoft, for example, which is now integrating Teams into SharePoint (in a way they never did, but should have, with Yammer). Alfresco is another example where document management is a core capability, in addition to web content, page layouts, etc. Q: In super large organizations like Cisco, how do you stop out of date content building up? It’s a big problem in every organization, including Cisco, who only recently moved to a full, proper content management solution (Adobe). By creating strong, but pragmatic, governance and content management strategies that are supported by the necessary levels of awareness and change management. There is no magic bullet, but ignoring the issue is worst. However, ensuring that every page has an expiry date, which is enforced by the system at the time of publishing. All content should have a renewal date, an expiry date, and a deletion date (if it is not renewed). Q: How are these companies driving people to their intranet? Do they use a weekly broadcast email pointing to new content. digital signage,etc.? Ubiquity – use of multiple devices (desktop, phone, tablet) so people can rely on access at anytime, anywhere. In addition, awareness and promotion is a constant effort not unlike marketing any product or service to a user population. At companies like IBM and CIsco, they’ve had intranets for 20 years, and everything is done on the intranet — everything relating to HR and finance, and admin, and communications. It’s part of the culture in every part of the workday.